American Expatriates, Ballets Russes, carpe diem, Guillaume Apollinaire, Léo Ferré, Marie Laurencin, Roses, Translation of "Marie"
I have translated “Marie,” mostly literally, a poem by Guillaume Apollinaire (26 August 1880 – 9 November 1918) set to music by singer-songwriter Léo Ferré. 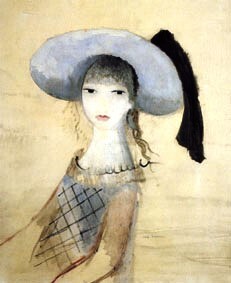 Marie is Marie Laurencin (31 October 1883 – 8 June 1956), an “avant-garde” artist and advocate of Cubism, but not a follower of the movement. However, she was a moderniste. Marie’s paintings are relatively easy to identify. Her style is quite unique. Marie Laurencin was acquainted with a large number of artists, literary figures, and persons associated with Sergei Diaghilev‘s Ballets Russes, one of whom was a young Pablo Picasso. She also attended the salons of wealthy United States expatriates who made Paris their base and helped propel to fame and sometimes to wealth artists such as Pablo Picasso, Henri Matisse, and Georges Braque. 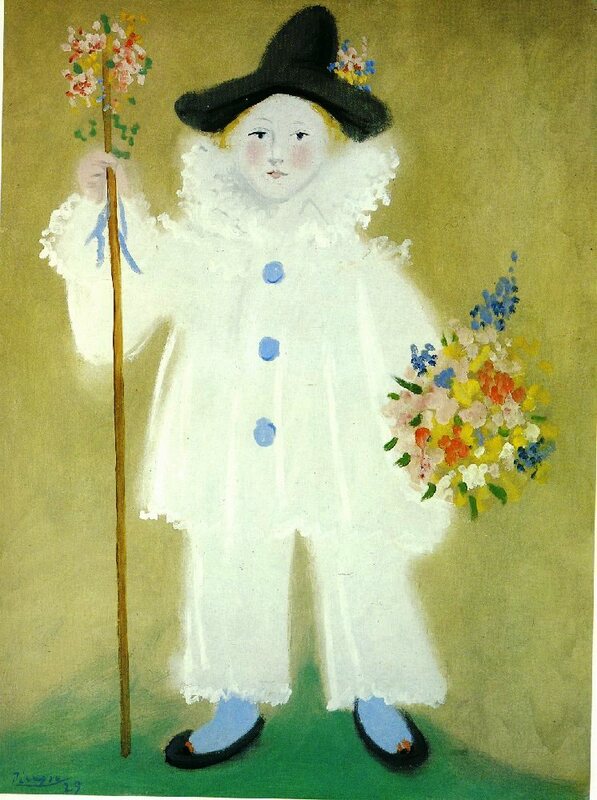 Celebrated artist Marie Laurencin was very different. Marie was married to German Baron Otto von Waëtjen from 1814 until 1820, but she was romantically involved with revered and now legendary poet Guillaume Apollinaire, born Wilhelm Albert Włodzimierz Apolinary Kostrowicki. Apollinaire was wounded during World War I and died two years later. He was a victim of the Spanish flu pandemic of 1918, a flu akin to the Swine flu of 1976, but as merciless as the plague. The imagery used by Apollinaire includes the sheep’s fur and hair: animal, human. The imagery also includes the masques (2), as in a masquerade ball and the commedia dell’arte. In fact, Marie Laurencin’s “Dancer,” shown above, is dressed like Harlequin, a masque and a stock character in the commedia dell’arte. We have colours, that of the sheep and of the snow: white, but also silver or grey (grey hair). There is an allusion to soldiers. Apollinaire had been a soldier. Marie is an anagram of aimer: to love. I thank you for your kind words. They’ve helped. My university and the insurance company played with my life and it has been extremely painful. So I am pleased I have my WordPress colleagues and send all of you my love. Picasso[i] had several relationships, but he was a husband to Russian ballerina Olga Kokhlova (17 June 1891 – 11 February 1955). He met Olga during the production of the Ballets Russes‘ Parade (1917). In the early years of the twentieth century, there was no better creative milieu in Paris than Sergei Diaghilev‘s (1872 –1929) Ballets Russes. The Russian impresario recruited the most talented individuals of his days and, among them, Pablo Picasso (25 October 1881 – 8 April 1973). 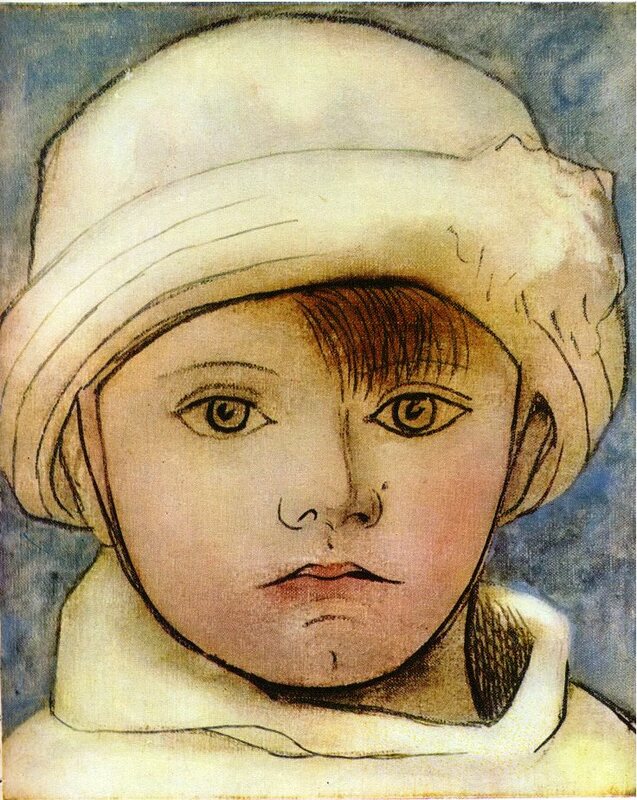 When he was employed by Sergei Diaghilev, Picasso was mixing with le tout Paris, or the cream of Parisian society. For instance, the production of the ballet Parade (1917) brought together composer Érik Satie (17 May 1866 – 1 July 1925), legendary writer and future filmmaker Jean Cocteau (5 July 1889 –11 October 1963) and choreographer Léonide Massine (9 August 1896 – 15 March 1979). Érik Satie (17 May 1866 – 1 July 1925) was one of the main composers of his era. Beginning in 1888, Satie composed the Gymnopédies. [ii] Jean Cocteau is the author of the 1929 novel Les Enfants terribles, which he would transform into a film in 1950. [iii] Finally, when it premièred at Paris’ Théâtre du Châtelet, on 18 May 1917, Parade was conducted by Ernest Ansermet (11 November 1883 – 20 February 1969) who founded l’Orchestre de la Suisse Romande (1918). Shown below is Parade‘s curtain, Picasso’s largest work. 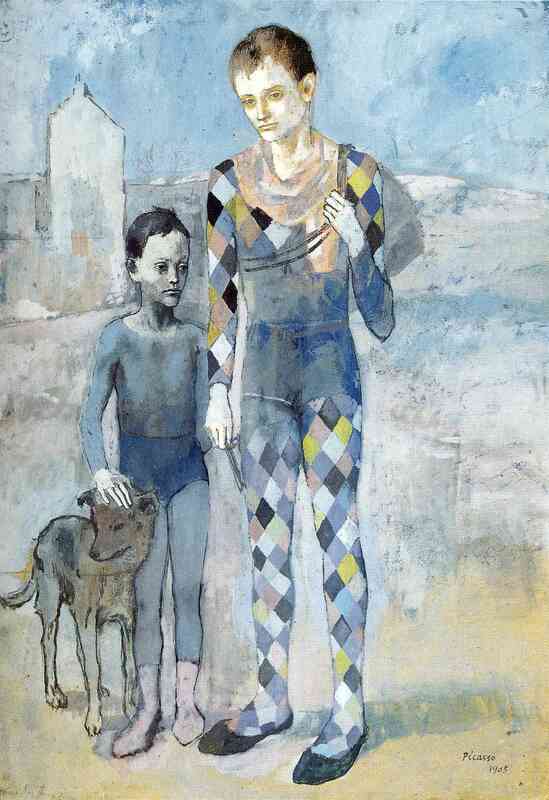 It features the nimble Harlequin, a recurring figure in Picasso’s artwork, portrayed here in the artist’s first work as costume and set designer. Parade’s curtain also features mythology’s winged horse Pegasus. 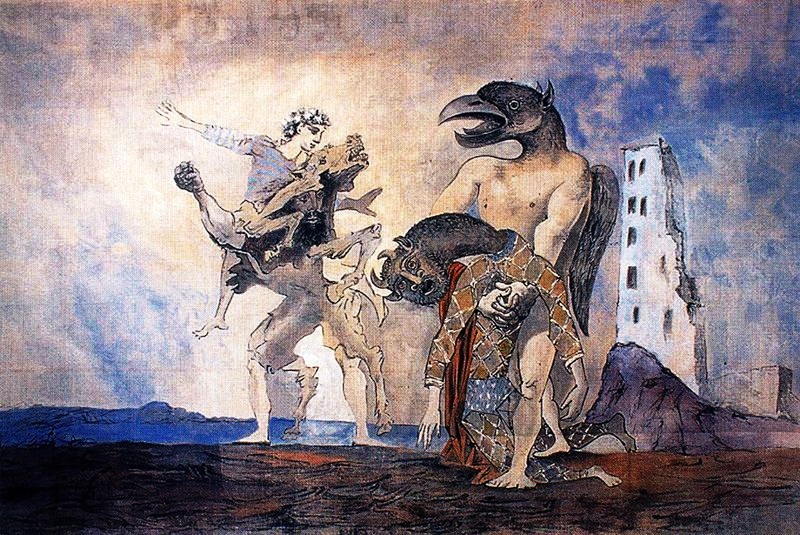 Later in Picasso’s career, mythology, the Minotaur in particular, would be a significant motif. In 1919, Ernest Ansermet would conduct Manuel de Falla‘s (23 November 1876 – 14 November 1946) El Sombrero de tres picos (The Three-Cornered Hat or Le Tricorne), a Ballets Russes production choreographed by Léonide Massine with costumes and set designed by Pablo Picasso. The Three-Cornered Hat premièred in London at the Alhambra Theatre, on 22 July 1919. Pulcinella (Polichinelle) is a zanni from la commedia dell’arte. Igor Stravinsky composed the music. 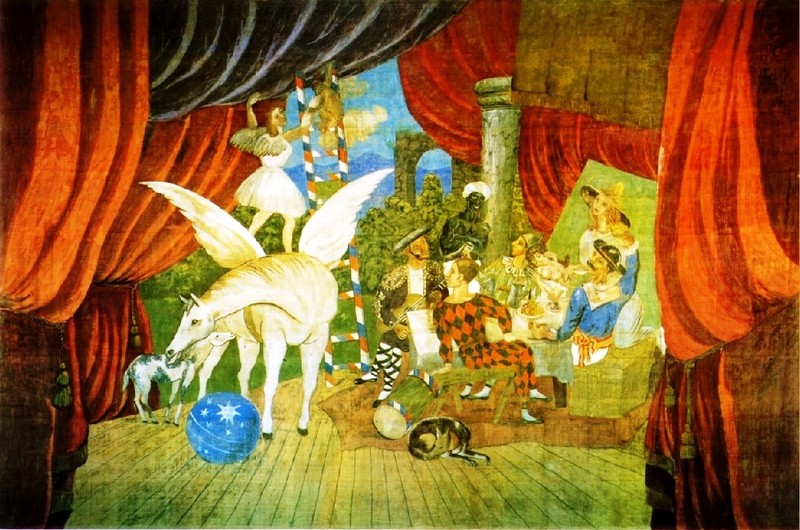 The ballet was choreographed by Léonide Massine, who also wrote the ballet’s libretto (the text), and Pablo Picasso designed the costumes and the set. Pulchinella was first performed on 15 May 1920 under the baton of Ernest Ansermet at the Paris Opera (Palais Garnier). The Ballets Russes would also employ costume and set designers Léon Bakst and Alexandre Benois (both Russian) and choreographers Marius Petipa and Michel Fokine. However, the Ballets Russes had no greater star than Polish ballet dancer and choreographer Vaslav Nijinsky (12 March 1889/1890 [Kiev]– 8 April 1950). Diaghilev was at times a little too punctilious, but his contribution to what composer Richard Wagner called Gesamtkunstwerk (total art) is exemplary. The Ballets Russes defined an entire era of the twentieth century and Pablo Picasso’s work with the company gave enormous impetus to his career. This was more than just a dance company; it was a creative movement which, from its inception, drew to itself the greatest musical, theatrical and artistic talents of the day. American writer Gertrude Stein lived here with her brother Leo and then with Alice B. Toklas. She received numerous artists and writers from 1903 to 1938. On 4 April 2013, I posted an article entitled Henri Matisse: an Eclectic Modernist. It refers to Picasso’s acquaintance with Gertrude Stein, Alice B. Toklas, members of Stein’s family, and the Cone sisters. The next two paragraphs are therefore somewhat repetitive. Yet, it should be mentioned that Picasso’s most fervent aficionados and promoters were Americans in Paris. He owes much of his relatively early success to Leo Stein and his sister Gertrude Stein (3 February 1874 – 27 July 1946). In fact, we could start a whole new series entitled: Americans in Paris. These Americans were wealthy and became patrons to the Impressionists and all that was avant-gardiste in Paris: Fauvism, Cubism, Surrealism, etc. Gertrude Stein was a salonnière. Few addresses are as famous as 27, rue de Fleurus, Paris 6. An invitation to 27, rue de Fleurus, Stein’s home and that of her lover, Alice B. Toklas, was almost as much a privilege in twentieth-century Paris as entrée to Madame Geoffrin‘s Parisian salon had been in the eighteenth century. 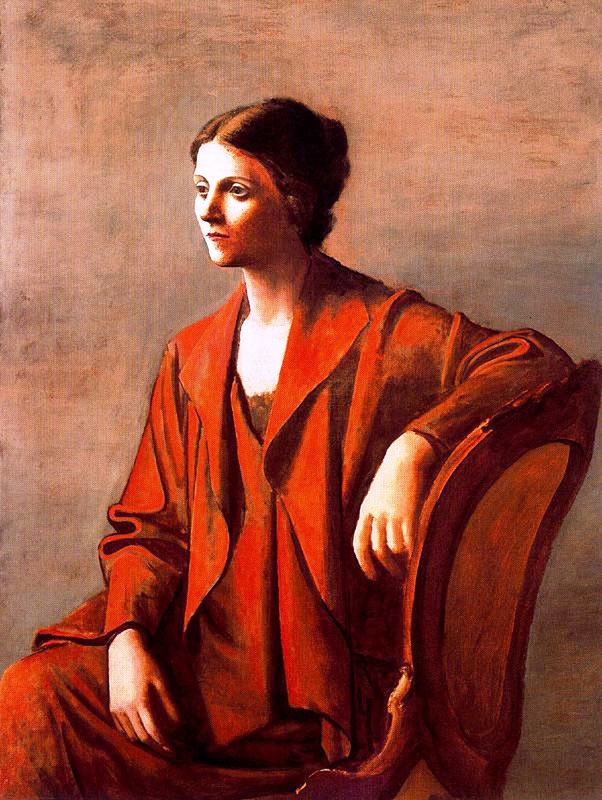 Olga Kokhlova was a socialite and therefore facilitated Picasso’s introduction to Paris’ world of music, design, choreography, dance, and literature. 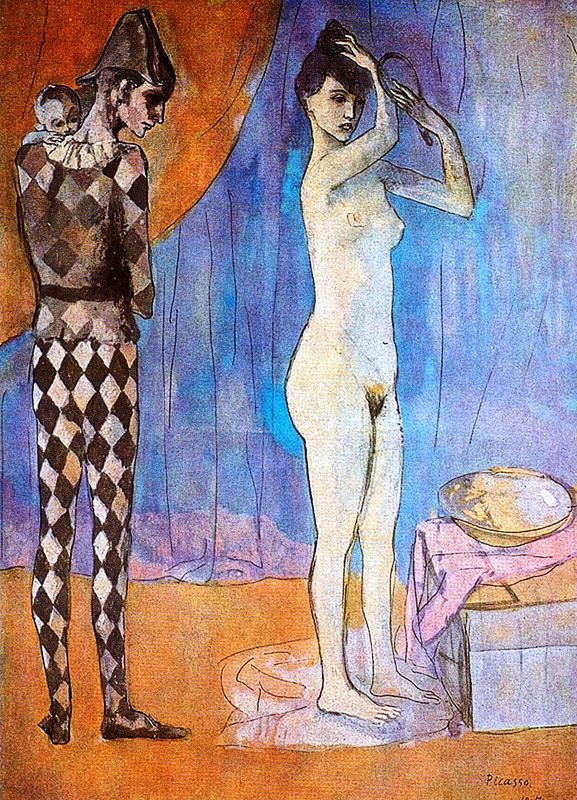 The two married on 18 May 1917 and, three years after Parade, on 4 February 1921, Olga gave birth to Picasso’s first son, Paulo, depicted above as Harlequin and Pierrot (Pedrolino), Commedia dell’arte figures. But let us return to Harlequin. In 1906, Picasso depicted him as dead (see below). At that point, reports of Harlequin’s death were premature. 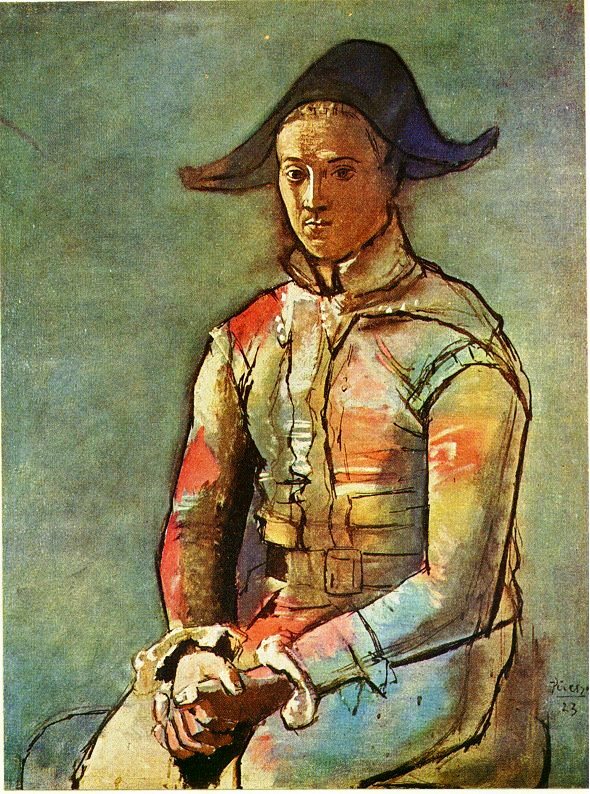 Picasso continued to depict Harlequin and other characters from the Commedia dell’arte, which makes him heir to Jean-Antoine Watteau (baptised 10 October 1684 – 18 July 1721). However, Picasso’s settings of Commedia dell’arte figures are less ethereal than Watteau’s bucolic fêtes galantes. Yet both artists drew part of their subject matter from Italian comedy and from ballet, without portraying disorderly buffoons. Picasso was also influenced by seventeenth-century Spanish artists Diego Velásquez – “Las Meninas” – and El Greco. In short, despite a failed marriage, Paris was kind to Picasso who remembered Harlequin and other characters from the Commedia dell’arte. I apologize for not posting more often. The problem is a long and disabling episode of Chronic Fatigue Syndrome. [i] “Pablo Picasso”. Encyclopædia Britannica. Encyclopædia Britannica Online. [ii] Érik Satie was one of “les Six,” probably named “les Six” after the Russian “les Cinq.” The “Six” are Emmanuel Chabrier, Claude Debussy, Gabriel Fauré, Maurice Ravel, Érik Satie, and Richard Strauss. [iii] Among other films and various works, we owe Jean Cocteau his 1946 Beauty and the Beast, but he is better known for his 1929 novel and 1950 film Les Enfants terribles. “Harlequin with his hands crossed,” featured above, could well be Picasso’s finest Harlequin. He is not wearing his lozenges. In fact, the colours have bled. Nor is there a mask, except a reminder. Harlequin’s brow is floured. In the Harlequin featured to the left, no mask is suggested, but the lines are somewhat thicker, barely. The painting is also dated 1923. These two depictions of the Harlequin therefore follow the production of Stravinsky‘s Pulcinella, first performed in 1920. Both characters are zanni, or servants, but Harlequin is the smarter zanno. Picasso’s depictions of Harlequin do not show a theatrical Harlequin. Picasso’s Harlequins are off-stage and the artist’s depictions are portraits of distinguished individuals. It is difficult to associate these Picasso Harlequins with British very comical Harlequinades. Harlequin is a significant motif in Picasso’s work where he is sometimes pictured with his family. 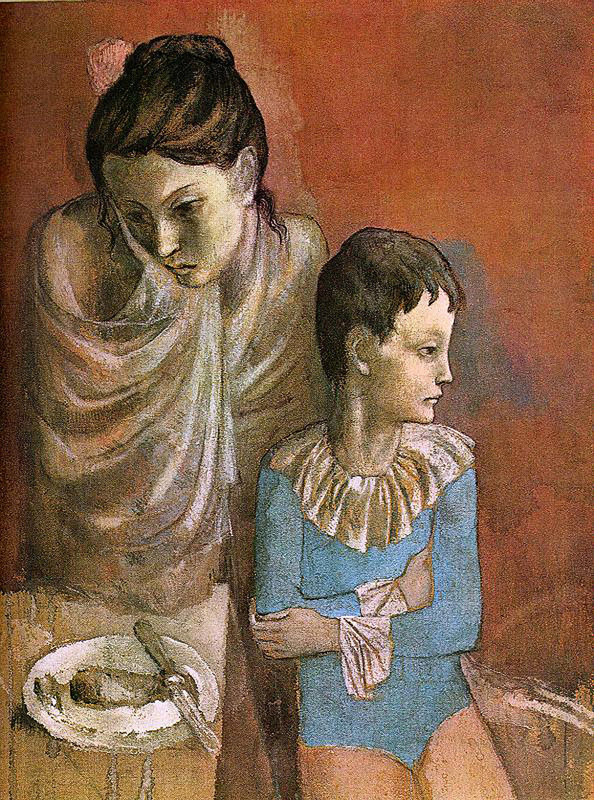 He is also an element of Picasso’s “Mother and Child” motif. 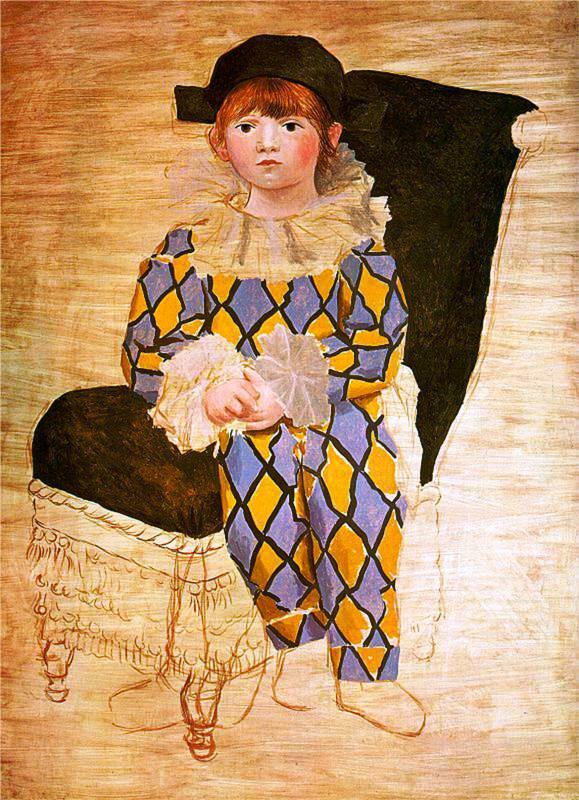 In other depictions of Harlequin, a male adult may accompany a child. 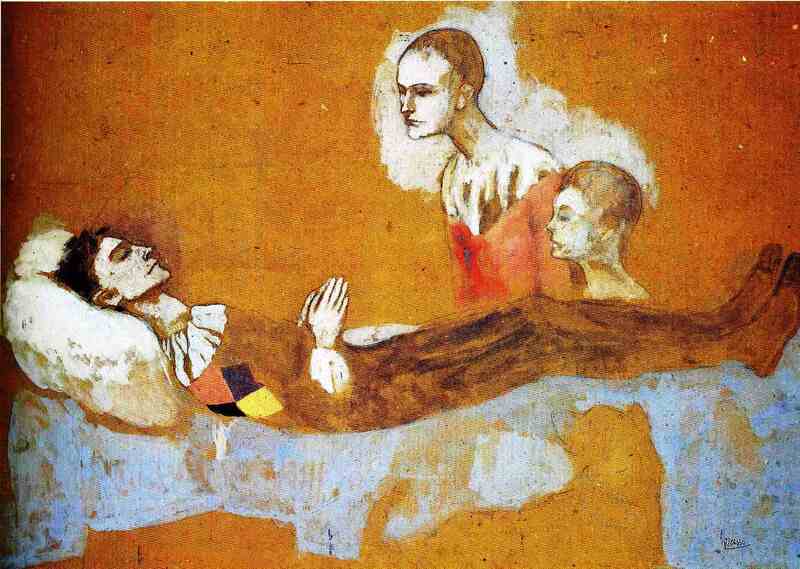 Picasso also portrayed Harlequin on his death bed. Picasso was versatile where his techniques are concerned: oil, gouache, watercolours, india ink. Each technique conveys a meaning to the artwork. The Commedia dell’arte zanni are very smart. They may have a love interest. For instance Arlequin loves Columbine who is also Pedrolino’s love interest. But their main function is to help the innamorati overcome obstacles to their marriage. This requires not only physical agility, but a cunning mind. Zanni have to devise stratagems. Picasso’s Harlequins dress a little differently from earlier Harlequins. They often wear a collapsed ruff, mixing Pierrot and Harlequin characteristics. This cross-dressing adds piquancy to Picasso’s art. At times, Arlecchino can only be distinguished by his fallen ruff and slender figure. In short, a world view is expressed in Picasso’s Harlequins. His Harlequins are consistent with one another. Picasso’s Harlequins do not cry. But they are very human, not marionettes. And they have a family. I am offering a very small sampling of Picasso’s Harlequins, but they are true representatives of Picasso’s Harlequins. By clicking on the titles of the various artwork, you will be provided with technical details. Stravinsky’s ballet Petrushka (Ballets Russes; 1910-11) shows a somewhat clownish Harlequin-like figure, but it is not Harlequin. Beginning in the early nineteenth century, writers, artists, composers found inspiration in their country’s folklore, which very often was shared by other nations and cultures. Igor Stravinsky and Pablo Picasso were both commissioned to create ballets for Sergei Diaghilev using their respective talents. Picasso drew a number of costumes and designed sets. Both worked on the production of Pulcinella (Polichinelle; Ballets Russes, 1920). It was a Golden Age. 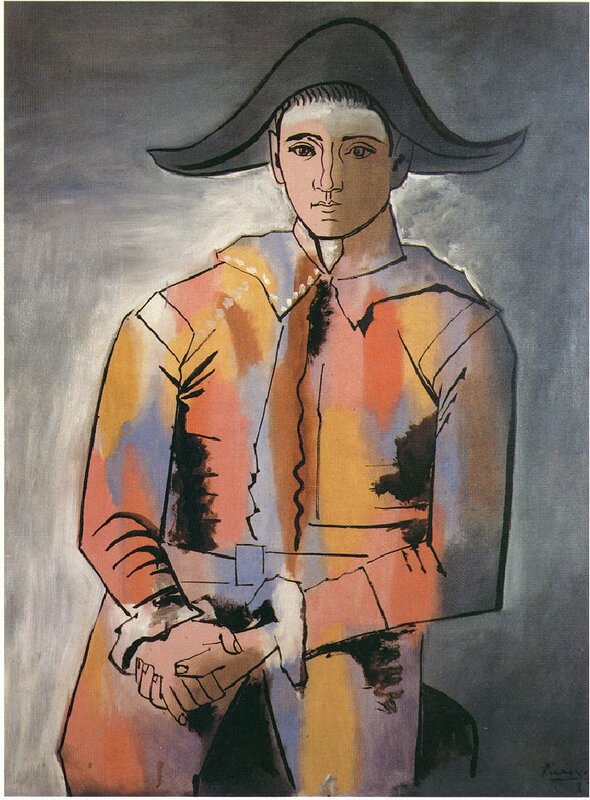 As for Picasso, he found much of his inspiration in the commedia dell’arte and in particular, in the Harlequin. This is a humble offering. 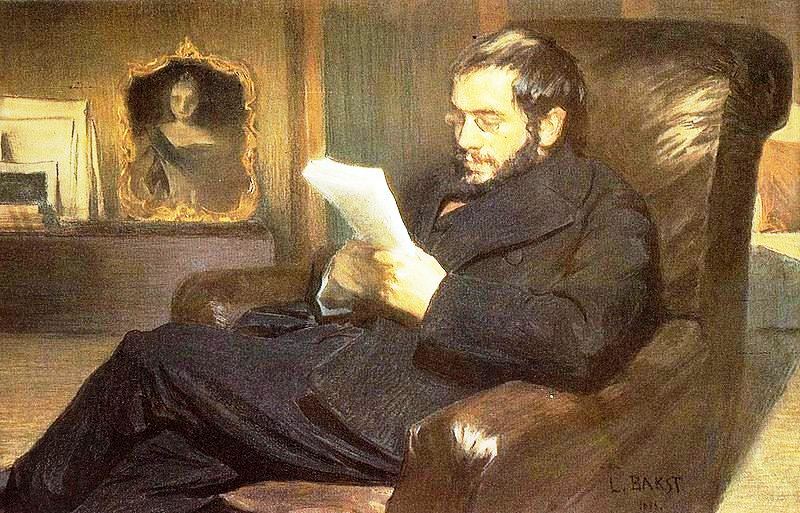 I am forwarding the News mostly unadorned, except for the above painting of Alexandre Benois, by Ballets Russes artist Leon Bakst. Ballet was born in Italy. It moved to France. Louis XIV, the Sun-King, was a dancer. And it reached what may be its culmination in Russia: the Kirov, in St Petersburg, and the Bolshoi, in Moscow. However, Sergei Diaghilev‘s Ballets Russes, an itinerant company based in Paris, spread the love of ballet to several countries, the US, etc. and several artists contributed to its success: Leon Bakst, Alexandre Benois (set and costume designers). Its most famous choreographers were Marius Petipa (French) and Michel Fokine (Russian) and it starred the legendary Vaslav Nijinsky among other superb dancers. It provided composer Igor Stravinsky with several commissions. There is confusion concerning the spelling of Saint-George’s name. It seems that here George does not require an ‘s’, which is how George is written in English. However, Joseph’s name is often spelled the way the French spell Georges, with a final ‘s’. Saint George was/is a location. 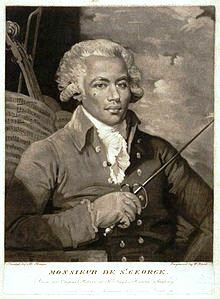 Originally, Saint-George(s)’s name was Joseph Bologne. To my knowledge, the recording featured in a post entitled Comments & the News: 14 September 2012 is one of the finest interpretations of Saint-George’s Violin Concerto, Op. 5, No.2 (Largo). It is performed by violinist Jean-Jacques Kantorow and the Orchestre de Chambre Bernard Thomas. Interestingly, while browsing, I somehow entered the British Museum and saw the picture featured in Le Chevalier de Saint-George: the Black Mozart. That picture is attributed to George IV himself. I reblogged two posts. The United States has lost four fine citizens under tragic circumstances, but retaliation does not seem advisable. If at all possible, the US should never again wage war in the Near-East or the Middle-East, or elsewhere. America and people all over the world mourn the loss of these four lives and the US will cooperate with officials in the Near-East to find their assassins. Using diplomacy is the better approach. Besides, can the US afford another war? Despite its billionaires, the United States is currently rather poor. Mr Romney and Mr Ryan may be thinking that President Obama lacks “resolve,” but I heard that word in September 2001. Where did “resolve” get the United States? More lives were lost and the cost of those wars remains to be paid. The time has come for people in the Near-East or the Middle-East to stop burning the American flag. 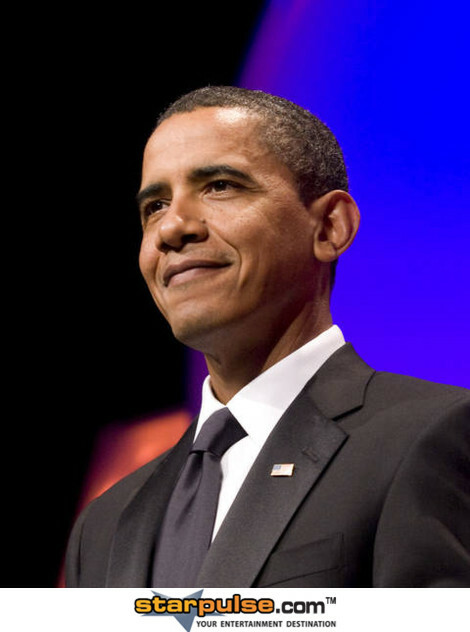 And yes, President Obama is the President of the United States of America. He has faced considerable obstructionism on the part of extremists in the Republican Party: Tea Party members. He must now be allowed to help the citizens of his country. Why should little me in Canada be looked after without paying atrocious amounts of money to see a doctor or buy medication? I pay my taxes. It has become abundantly clear that the Romney-Ryan team’s main objective is to be supported by a shrinking middle-class and the poor. The very wealthy hide their money in offshore accounts and ship too many jobs abroad where products are manufactured at a lesser cost. They (the very wealthy) are saving money, but you aren’t. Arithmetic was never my best subject, but it would not surprise me to learn that the price you pay for products manufactured elsewhere is the price you would pay for products manufactured in the United States. You save on products made elsewhere when there is a sale. Rich people who want tax cuts have yet to understand the concept of nationhood. The US has not recovered from the financial difficulties created by a former administration, a Republican administration, and Republicans do not want to pay their fair share of taxes. So who will pay the debt, a Republican administration? Beware. “Fool me once, shame on you. Fool me twice, shame on me.” Why should Americans seek a new President when it has the best it can have? The next face to grace Mount Rushmore should not be President Reagan‘s face, it should be Franklin Delano Roosevelt‘s, a gentleman who cared for the people. President Obama is walking in his footsteps. 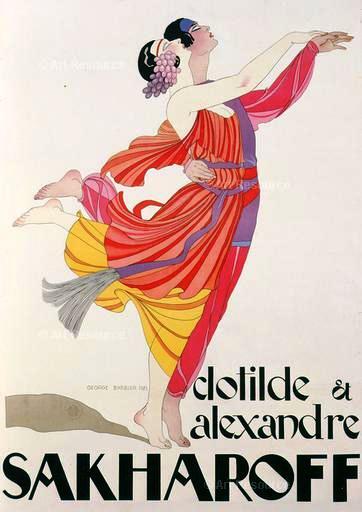 Clotilde & Alexandre Sakharoff, by George Barbier (1882-1932) Russian dancers, 1921 poster. I wish I could have found a video featuring Clotilde and Alexandre Sakharov. But we have done very well. YouTube provided us with a performance of the grand Pas de deux, from Marius Petipa‘s Don Quixote (music by Ludwig Minkus), executed by Natalia Osipova & Ivan Vasiliev, now stars of the St Petersburg’s Mikhaylovsky Theatre and a married couple. Barbier’s coloring is impressive. Note, for instance, how he has used color to separate the bodies of his two dancers. Musée de l’affiche, Paris (Photo credit: Alfredo Dagli Orti / The Art Archive at Art Resource, NY (with permission from Art Resource, NY). For more information on the Ballets Russes, in Paris, please click on Sergei Diaghilev, Ballets Russes and Vaslav Nijinsky. The Ballets Russes toured between 1909 and 1929, and Paris loved them.